... the devotional book, JESUS CALLING. I had heard about it for some time, but hadn't gotten one. I guess through the years I've gotten jaded. Certainly skeptical, which can often lead to being cynical. I think there are lots of folks out there that put sweet stuff in a book, and sell it. Some of that stuff, in my opinion, has no depth, and not much validity with me. Who am I to critique that stuff? Well, I'm a Christ-follower who wants to be true to the Bible. And I want depth, not fluff. 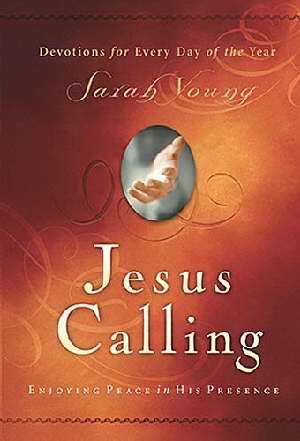 Sarah Young's JESUS CALLING is, to me, a true devotional. It helps me be more devoted to Christ, and the fact that it has at least two Bibles verses on each page that you can look up and get more in depth, well, I like that. And those verses are not printed on each page. I can see how some wouldn't bother to look them up, but I really want to... so as to validate what Young has written. On a completely different note, Shiloh got sprayed (again) by a skunk Friday night. Ugh. Ah, but we have FOUND THE ANSWER!!! Sam made a call to his animal expert friend, Greg Bargsley, and found out about the hydrogen peroxide/baking soda/Ivory soap/ water solution. So Shiloh is lovable again. Well, he's always been lovable.... but now I can hug him again. I have a poll up (upper right). Please vote if you haven't already. Thanks!! Next time try baby shampoo bath followed by a vinegar rinse! Rinse that off then follow with a vanilla rinse and leave on. Worked on my Lab.